This is 'the' teacher training course for teachers and trainee teachers preparing for the Cambridge ESOL Teaching Knowledge Test (TKT) Modules 1, 2 and 3 or other initial teacher training qualifications. The TKT Course Training Activities CD-ROM contains 30 specially designed teacher training activities in convenient PDF format. 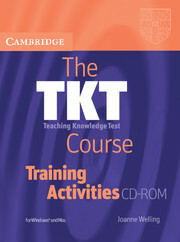 It can be used on its own or with the TKT Course Modules 1, 2 and 3 Second Edition book. Tackling each of the three core TKT modules in turn, these activities will help a teacher trainer bring the syllabus of the TKT to life. 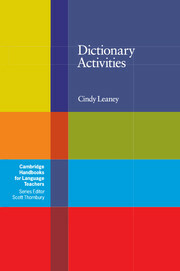 Ideal for use in TKT preparation, as well as general teacher training courses. Written by a team of experienced TKT writers in collaboration with Cambridge ESOL. ELT terms and concepts are clearly explained for non-specialist teachers. Model practice tests help candidates become familiar with the format and style of the TKT exam. Full answer key makes it perfect for self-study. Methodology section with practice tests in one volume provides a comprehensive package for TKT candidates.